The Only Way is Essex star Pete Wicks, Downton Abbey’s Peter Egan and Good Morning Britain presenter Philippa Tomson helped animal charity Humane Society International UK and 5 very special dog meat trade survivors, deliver a petition to the South Korean Embassy calling for an end to the country’s brutal dog meat trade. The hand in of nearly 700,000 signatures collected from around the world coincides with the start of Bok Nal, the hottest days of summer when dog meat soup is eaten in South Korea to combat the heat. The petition will remain open until the close of Bok Nal in August when HSI and partner group Korean Animal Rights Advocates will deliver the final total to The Blue House in Seoul, the residence of President Moon Jae-In. The stars’ canine companions for the day were all saved from death row on dog meat farms by Humane Society International, as part of the charity’s ongoing effort to assist dog meat farmers to close down their dying businesses and switch to alternative livelihoods. Bindi, Charlie Brown, Roxy, Elsa, Faith, George and Sophie were rescued by HSI on two separate farm closures, and Pete, Pip and Peter joined the charity on these rescue missions to see first-hand the horrors of the trade. For Pete Wicks, helping HSI close down a dog meat farm in Namyangju last year, at which more than 170 dogs and puppies were rescued, was an emotional experience. More than 2 million dogs are raised for human consumption on thousands of farms across South Korea, but attitudes in the country are changing, and HSI’s farm closures are part of the charity’s strategy to encourage the government to initiate a nationwide phase-out of the trade. It’s an initiative that has so far seen HSI close twelve farms and rescue more than 1,300 dogs who have been flown to the United States, Canada and the United Kingdom to find loving homes. 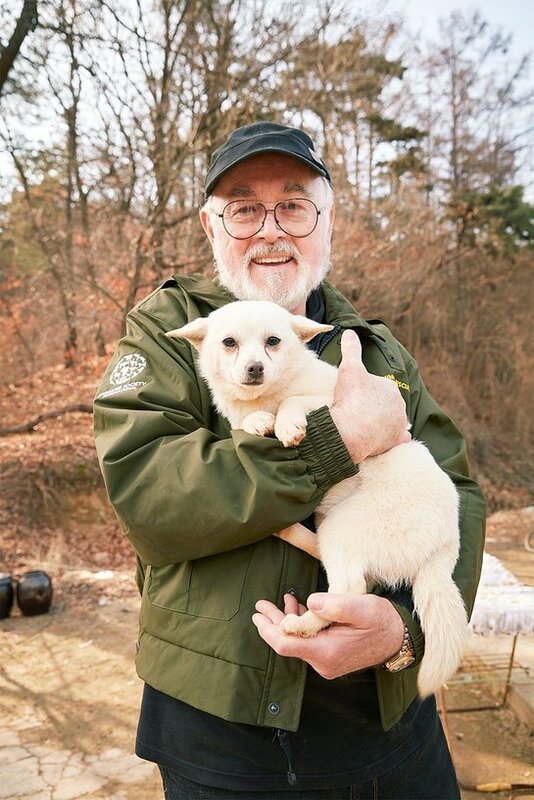 Peter Egan has also visited a dog meat farm closed by HSI, in 2017 the actor travelled to a farm in Gangwon province where HSI was working to save the lives of 200 dogs. At the petition hand in Pete and Peter were reunited with some of the dogs they helped to rescue and had a chance to meet the dog’s new families. Pete Wicks and Pip Tomspon are doing the Great North Run in September to raise money to help HSI shut down its 13th dog meat farm, their JustGiving page can be seen here. The petition is being delivered in South Korea in August, there is still time to sign to help the petition reach 750,000, the petition link can be seen here.